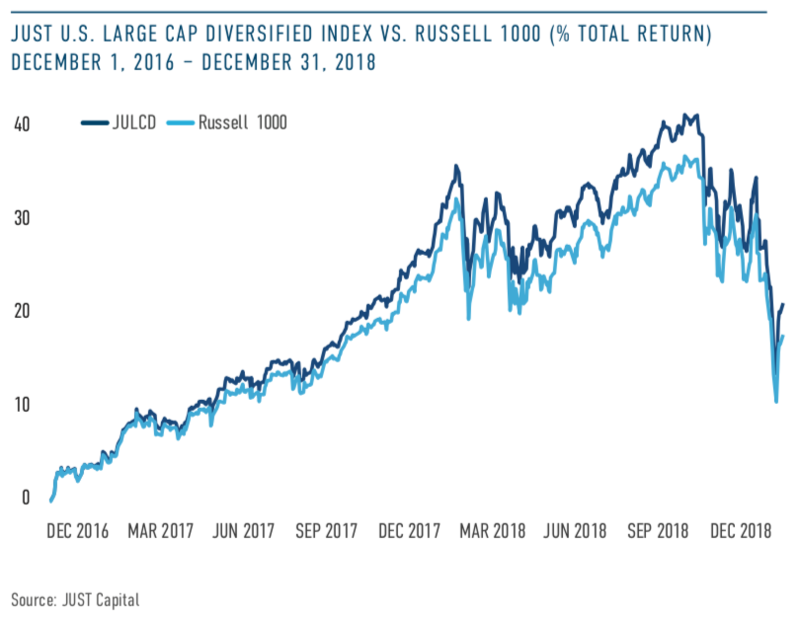 The JUST U.S. Large Cap Diversified Index (JULCD) is designed to track the performance of U.S. large-capitalization companies that most closely align with the American public’s definition of just business behavior. It is based on JUST Capital’s annual rankings of just business behavior, and reflects the values of the American public without sacrificing investment return. The fourth quarter was the most volatile for stocks since the Global Financial Crisis, with the JULCD declining 14.15%, slightly more than the Russell 1000’s 13.82% drop. Over the full year, the JULCD lost 4.05%, 73bp ahead of the Russell 1000’s 4.78% decline. On December 21st, following the release of our 2018 Rankings of America’s Most JUST Companies, the Index was rebalanced to reflect the new Rankings. To download the full report, which includes quarterly returns, top and bottom performers, and key insights, click here.